Chef Bryan Leary of Oak & Grain Restaurant shares his recipe for Braised Miles Smith Farm Short Ribs. 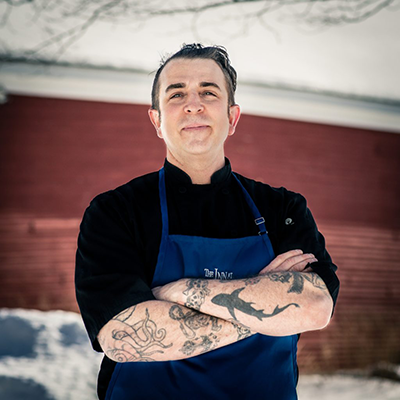 Chef Bryan Leary, Oak & Grain Restaurant at the Inn at Pleasant Lake in New London, NH. New England is my home. After traveling all around the United States and working in several styles and regional cuisine restaurants, I was anxious and excited to be back in New England where so much of our food can be locally sourced, and so many of our dishes are authentically inspired. I love to incorporate all of my acquired knowledge and our authentic New England ingredients to produce seasonally inspired menus. One of the best things about New England is that we get to celebrate every season with new foods. Braised short ribs to me screams fall food. Miles Smith Farm has a rich history and incredibly delicious beef. I personally visit all the farms I use and get to hear their stories and their visions. Incorporating the white miso from my experience in Korean restaurant really ties my past to my future. 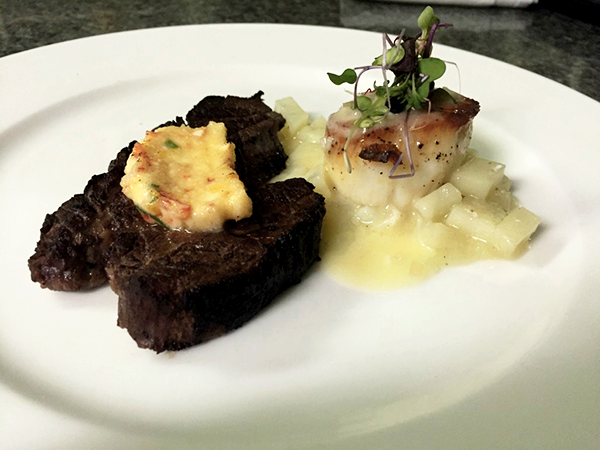 Bringing new flavors to seasonal New England dishes is my passion, and our guests at the Oak & Grain restaurant tell me they can both feel and taste that passion. That’s what we're all about! Oak & Grain Restaurant celebrates the diversity of New England and draws menu inspiration from travels abroad and the tradition of local cuisine. The restaurant delivers authentic flavors with an emphasis on using locally harvested products to deliver the highest quality of food for guests. Cut short ribs into 2 inch by 2 inch cubes. Season generously with salt and pepper. Heat dutch oven or other pot that is oven safe with a lid to medium high heat. Add oil to pot when it is hot not before. Add beef and sear on all side. Remove beef and hold on a separate plate. With same pan turn down to medium heat and add vegetables. Slowly caramelize vegetables. Then add tomato paste, cooking till color changes and tomato paste caramelize its natural sugars (about 5 minutes). Then add white miso and cook for one more minute. Then de-glaze with red wine. Place beef back into pot. Coat all the beef in sauce. Add water till beef is covered. Cover with lid and place in oven. Cook for 2 hours. Remove beef and place dutch oven back on stove top burner and slowly reduce for 20 minutes and then puree with a immersion blender or a regular blender. Use the reduction as a sauce. This goes great with mashed potatoes or polenta or roasted fall root vegetables! Show NH Flavors and The Inn at Pleasant Lake your food creation! Tag us on Instagram and Facebook at @nhflavors and @theinnatpleasantlake. Visit innatpleasantlake.com for more information about the Inn and Oak & Grain Restaurant.